the top-quality and unique product. GradeCode have our own factory. quality leather keep your pants right where they belong and don't worry about breaking! greater versatility than other suspenders. and understated. 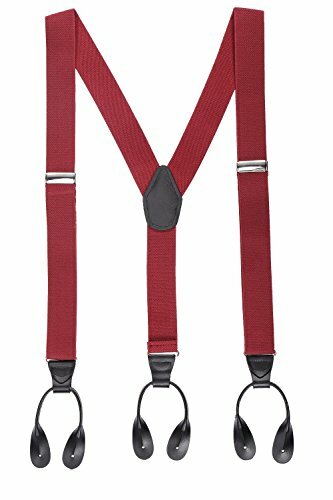 These suspenders also are popular due to their flexible collocation. prom, parties, formal events or daily wear etc. weight, and body shape of the person. So the size guide is only an advise. The best way to choose the appropriate size suspenders is to measure. Please refer to the picture above for the measurement method. because You'd better reserve about 2" to adjust. Wash as little as possible, if you want to wash, Hand-wash recommended. 2.Wipe off the water on the metal then drying out. CLASSICAL & COMFORTABLE DESIGN: Classic Y back style with soft black leather and Senior durable metal, Solid High density elastic strap and coordinate high quality leather can Hold up the neat appearance of trousers and make for comfortable wear. ONE SIZE FITS MOST: Approximately 1.38"/3.5cm wide. Adjustable strap measures approximately 32"~49"/80cm~125cm. ADJUSTABLE: The easy adjustable buckles and 49" strap are much greater versatility than other suspenders. MATCHES MOST OCCASSION: Great for trousers, jeans, suit, pants. Perfect design for dating, Wedding, birthday, prom, parties, formal events or daily wear etc. Best gift for your Grandfather, Dad, Husband, Brothers, Son, Friends, yourself or any other suspenders fans. GREAT GIFT FOR MEN: The premium Y back button suspenders make a perfect gift for any occasion, elegant gift box for the most presentable gift giving. If you have any questions about this product by G&C, contact us by completing and submitting the form below. If you are looking for a specif part number, please include it with your message.